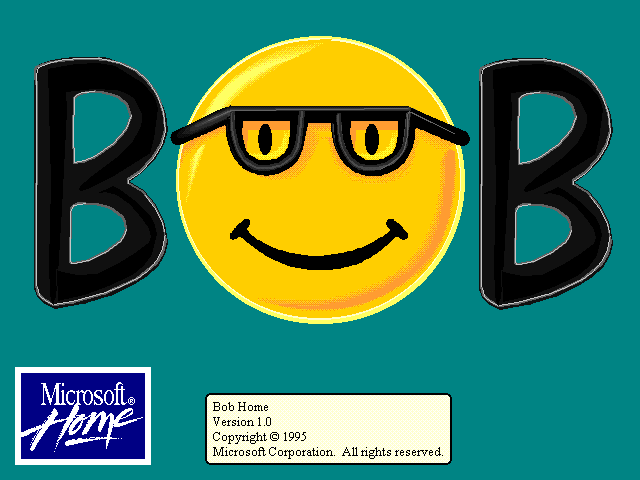 You may have heard jokes about some old failed Microsoft product called "Bob" or seen that big yellow smily face wearing nerdy glasses, and wondered "what the heck was that all about?". Well, in early 1995 Microsoft released a software program called "Bob" designed to replace the desktop of Windows 3.1 and 95 with an interface designed mainly for novice users. Microsoft held a big advertising campaign and loaded up stores with copies of Bob expecting huge sales. It totally flopped. Bob required a minimum of a 486 with 8 megs of ram, 30 megs of free disk space, and 256 color VGA. Many computers of the day did not meet these minimum requirements. It was too "cute" for the average PC users of the day. Most people at the time who wanted ease of use would just get a Macintosh. Bob was not useful enough to justify its initial sale price of almost $100. Windows 95, which was released later that year, had the new Windows Explorer user interface which wiped the floor with Bob. And so Microsoft Bob disappeared in to obscurity. 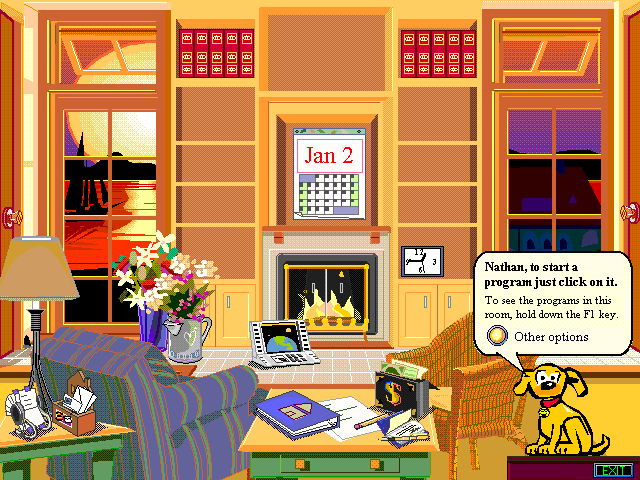 The Microsoft Bob splash screen. There appear to be two releases of Bob. These screen shots are of version 1.00 which has a time stamp of 1/30/1995. Then there is a second release, version "1.00a" dated 8/14/95, which included some additional guides, rooms, and objects. 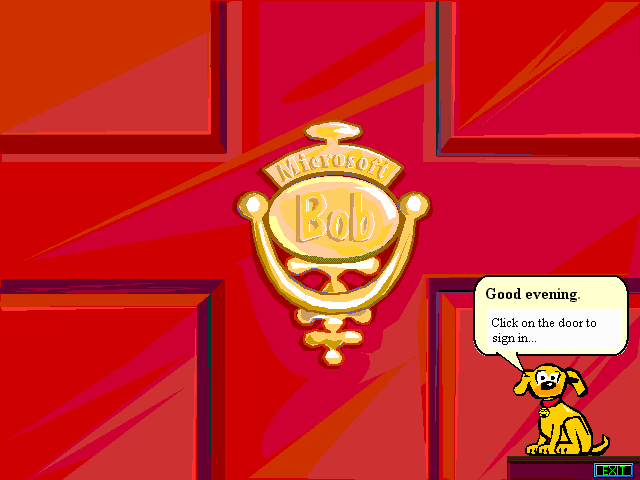 Microsoft Bob can be run as a regular application or it can be set to start up automatically when the computer starts. Before you can use Bob you must identify yourself. Use the knocker and select from a list of Bob users. If you are not in the list of users you must fill in some information to identify yourself. (This information is used later by the Bob programs). While users can can have "private" areas in Bob, there is no real security. This is the "Public Family Room" that you start off in. An interesting thing about Bob is that just about everything on the screen is drawn using vector graphics (Windows meta files). All objects can be resized to any size or stretched. This allows rooms to render smoothly at any screen resolution. One odd thing about the rendering, perhaps there is some reason, even on a display with millions of colors all graphics seem to be dithered to a 256 color palette. Many of the objects in the room are just decoration, but some of them launch special applications that only work inside Bob. The critter in the corner is "Rover", your guide. Ummmm.... "scrumptious"? Perhaps they should have named him "Fruit Loop" instead. On a more technical note, the different guides insert different descriptive words in to many of the common dialogs. This customizes the text to the "personality" of the selected guide. 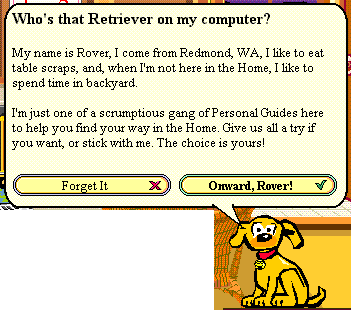 "scrumptious" is one of Rover's words. You can select other guides, but Rover comes back at various times.